The tablet market is basically imploding. The number crunchers at ABI Research have found that shipments of OEM branded tablets experienced a year-over-year decline of 13% in the first quarter of 2015. There is no denying the market is losing its momentum. The market is in the process of going through a transition as developed markets shift to a refresh/replacement cycle. In addition, vendors are feeling the squeeze due to new devices gaining traction in the market that are in direct competition with tablets, for example, 2-in-1s, phablets, and Chromebooks. If our experience offers any clues, consumers in mature markets like the US are not replacing their tablets. Our four-year-old iPad 2 is still going strong and we have no plans on replacing it anytime soon. And if our behaviour represents a microcosm of other buyers, the replacement cycle really isn’t all that strong. Adding to tablet vendors’ woes, phablets (large-screen smartphones) and 2-in-1s are pushing into tablet territory. ABI Research predicts branded tablet growth will remain flat to slightly negative over the next year. Major tablet vendors including Apple and Samsung are experiencing much pain. Apple lost significant share of the tablet market for the second quarter in a row as shipments declined and growth of the overall market remained stagnant. Apple shipped 21.42 million iPads in the fourth quarter of 2014 (an 18% year-over-year decline) and just 12.62 million units (a year-over-year decline) in its most recent quarter. Samsung too reported a year-over-year decline of 30% for the first quarter of 2015. Microsoft is likely feeling the pain too with its recently launched Surface 3 tablets. 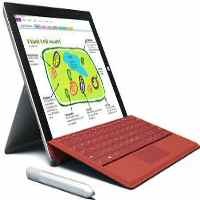 There has already been a round of discounts to get the pricey Surface 3 units off the shelves but I doubt the discount strategy is working. Microsoft’s first foray with the Surface was a disaster causing it to take a huge writeoff of $1 billion on the misadventure. Prospective tablet buyers should hold off for a few months to see if the slowdown triggers another round of discounts from the major vendors.